As my son nears his 18-month check-up, I am counting my lucky stars that he’s usually a breeze at the pediatrician’s office. With the exception of when he’s had a bad ear infection, he’s always pleasant and cooperative while he’s being poked and prodded. I imagine, though, that things might get a little more difficult as he gets older and more aware of what’s really going on. Just like the grocery store has become a bit more of a challenge. And the bank. And the dry cleaners. With that in mind, I’ve been thinking of ways to turn a standard doctor’s appointment into a learning experience for my toddler. Learning is everywhere, of course, and intentionally facilitating it can transform a ho-hum errand into a fun and productive experience for everyone. If patience is a virtue, then I’m pretty tainted. Waiting is a guaranteed part of life—especially at the doctor’s office—and I want to teach my son to handle it better than I do. Here’s the plan: My toddler is currently learning the difference between marching, jumping, and walking on tippy toes, so we’ll be practicing those during our downtime in the examination room. We’ll also probably run through all the animals on a farm and their corresponding sounds at least twice. The point? The doctor’s office is a perfect place to show your toddler how playing games and being silly makes time go by faster. Similarly, older infants and toddlers are at the perfect age for learning the various parts of the body. A very appropriate exercise would be to name the different body parts the doctor will check, point to them, and then say what they do. Toddlers are right at the age where they can begin associating the pediatrician’s office with the dreaded shots. On the one hand, that means it’s quite likely you’ll have a kicking and screaming child to deal with. On the other hand, it also makes for a great opportunity to teach your toddler about fear. The key, I think, is to encourage your little one to be brave while simultaneously letting him/her know that it’s ok to cry. Too often we go to one extreme or the other—fear is either overly dramatized or diminished. Instead, we should let our toddlers know it’s ok to feel scared but that they still must face the situation. I’m trying to make a point of explaining everything to my toddler, so that rules and obligations don’t seem quite so arbitrary. Like we don’t throw toys because they could hit someone or something. Or we don’t eat chocolate at 8am because we can’t miss out on all the healthy breakfast foods. A trip to the doc is the perfect opportunity to talk about all aspects of healthy living—the importance of eating nutritious foods, getting physical activity, and going to the doctor for check-ups. Like most toddlers, my little guy is obsessed with songs and rhymes. Bonus points if they have accompanying hand motions. Here are a couple of relevant (and fun!) ones we’ll be doing in light of our trip to the pediatrician. What do you think of these ideas? 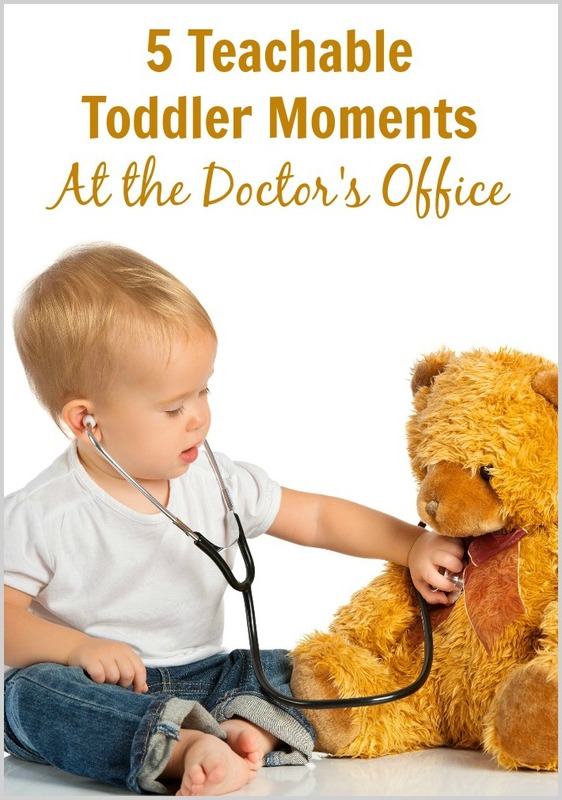 Any other thoughts on how to make a doctor’s visit a learning opportunity for a toddler? Oh patience! My kids don’t seem to have learned that one. My youngest son constantly seems to be pointing out that we’ve been waiting 30 minutes, 45 minutes, etc…as if I didn’t already know! I think maybe they have learned that from me. Yikes. Seriously though, this is a great list! I’m headed to the doctor’s office (again) today with my 4 y/o. A travel-size Magna Doodle is a great way to pass the time. I usually take a few books, too. Love these tips for little ones! My son is 19 months! And it is getting harder. He was so mellow, always. He learned to walk on the later side, which I attributed to his mellow personality. He finally walked without holding onto anything at 16 months. And since then? He tears away from me in public all of the time! I love the idea of doctor visits being teaching opportunities. And I agree. And when he was born, my daughter would come with us to his appointments and it was very teaching to her. To see her baby brother get shots and exams, made her braver when it was her turn again! And they got flu shots together and she made it her mission to hold his hand when it was his turn. That’s awesome how the siblings helped each other! These are some great ideas. I’ve also found that giving a dum dum (lollipop) to my two-year-old (or any sugar, really) works like a charm to distract him from the shots and crying is reduced to a minimum. My son wears hearing aids, so we see several caregivers on a regular basis: his pediatrician, his audiologist, and the opthamalagist. I found that reading books to my son about the kind of visit he was going to have (general check up? hearing test? eye test?) helped prepare my son for whichever appointment we were headed off to. He also has a play doctor’s kit, which we brought one time when I knew he was going to be uncomfortable. Being able to “listen” for the doctor’s heartbeat helped him connect with the pediatrician and ease crying when it happened. Those are AWESOME tips! Thanks so much for sharing! Maine has a program where each child age 0-5 gets a book when they go to their annual doctor visit. They always give the book at the very beginning so we can read while we wait for the doctor. That was always helpful. We also had lots of conversations about what objects we saw in the office, what colors we could find, etc. Anything to pass the time! California has something similar, except that they give you the book as you’re leaving. I like the way Maine hands out their books! I don’t have a learning opportunity suggestion, but I do have a tip to distract kids when they are preparing for a shot. I find funny photos online (animals doing funny things are good), and show them to my kids while the nurse is prepping their arms. They want the distraction and it helps them get through the ordeal with a few less tears. Love that tip! Thank goodness for smartphones in that situation. You’re right, it does get a little tricker as they get older. Our office has a nice section of toys, and even a few in each waiting room which I really appreciate! But then of course you have to think about washing hands constantly! My kids enjoy doodling on the exam table paper. Our pediatrician also has the rooms decorated with different themes, so they get excited about which room they’ll be in. The solar system room has glow in the dark stickers so we always turn off the lights to wait for the doctor in there! Love the idea of doodling on the exam table paper! I like your positive attitude! I must try out your tips the next time we have a doc appointment. These are great, Katie. I hadn’t even considered doctor’s appointments as teachable moments, but you’re right, why shouldn’t they be? I agree about your points regarding fear. I also like to bring a comfort item in case my kiddos get scared. And I usually empathize so that they know others can relate. This hopefully doesn’t diminish or dramatize the fear (love that description!). Great points! Bringing along a comfort item is a great idea!